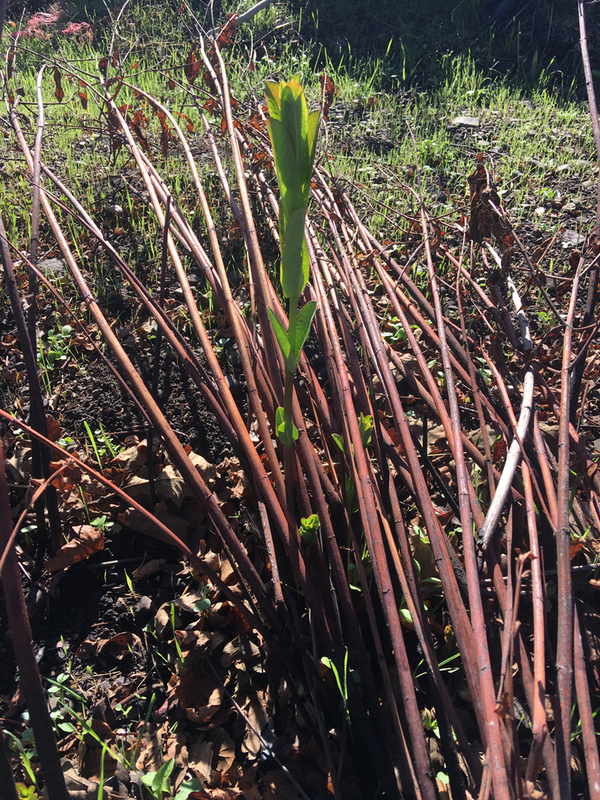 A few times a year, Edward Willie tends to the last remaining dogbane patch in Sonoma County. Situated on a three-acre preserve bordering Highway 101 in northern Santa Rosa, the patch is estimated to be centuries old and once spanned a five-mile radius. Neighboring tribes—mainly Pomo and Wapo—cultivated the fibrous, stalky native plants to make cordage for hunting and fishing nets and other tools. In October, the Tubbs Fire burned hot and fast through the preserve on its way to hopping the six-lane highway, leaving behind a scorched landscape of Himalayan blackberry roots and the black skeletons of wild plum trees and coyote bush. Yet, for the most part, the dogbane survived. In some formerly vegetation-choked areas of the preserve, the spindly plants are all that remain. 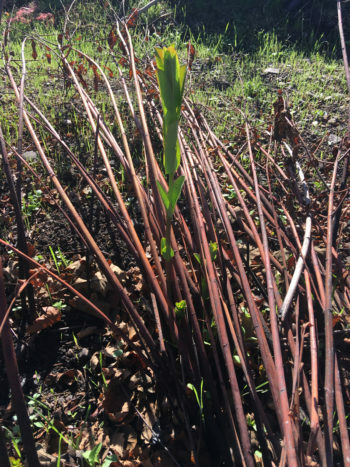 “The dogbane needs fire—that’s what makes it grow tall and strong,” says Willie, a native Pomo, Walaeki, and Wintu teacher and a core organizer of the Buckeye Gathering, an annual nature-based, paleo-technology meeting in Northern California. Researchers have found that dogbane sprouts quickly after fire and can become more abundant. Burning actually stimulates new, straight growth. 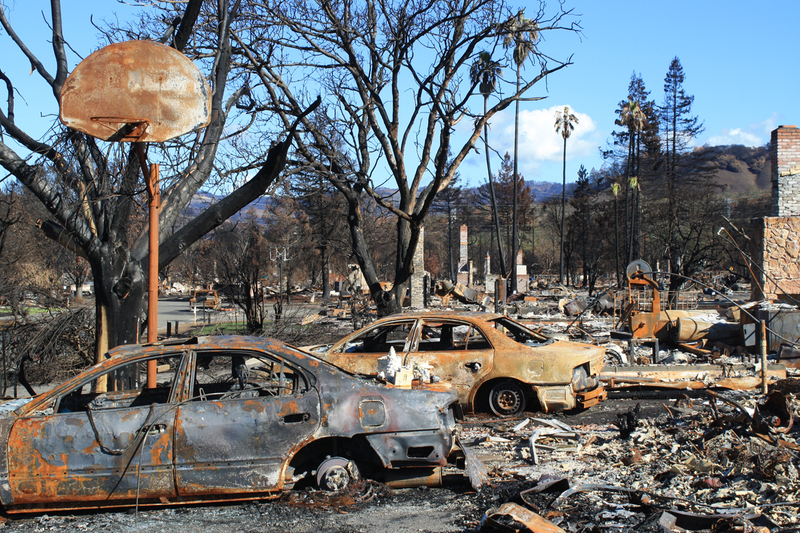 Less than a mile away from the preserve, block after block of ruined homes, businesses, and cars stand as a reminder of the conflagration that wreaked havoc across three Northern California counties. 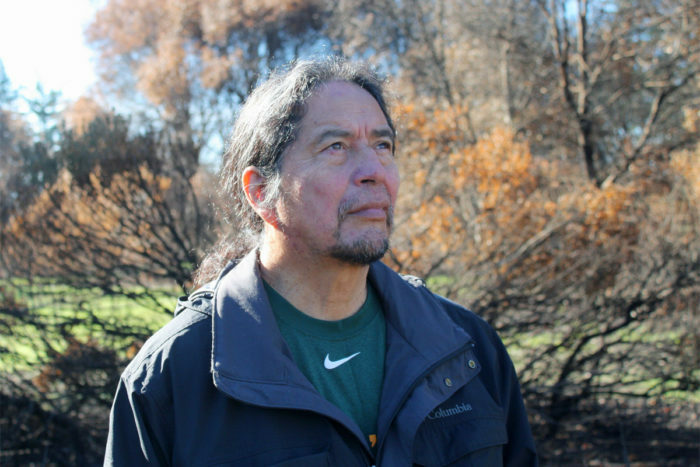 Despite the scope of the tragedy, Willie sees regeneration and even radical hope in the region’s fire ecology. There is no silver lining to a fire like those that struck Sonoma and Napa counties in October, or the still-burning Thomas Fire in Southern California, which has burned 281,900 acres to become the largest California wildfire in modern recorded history. But for people like Willie and Erik Ohlsen, an ecological designer and director of the Permaculture Skills Center in Sebastopol, the North Bay fires are a wake-up call, a chance to proactively address the way the plants and animals of Northern California, and most of the Golden State, have co-evolved with fire—and to rebuild these communities with fire in mind. Others go further, saying that poor planning and land management practices turned a natural feature of chaparral landscapes into a catastrophic force, leaving in its wake $3 billion in estimated damages. The city of Santa Rosa alone has already blown through $5 million from their general fund to fight the fires and the massive recovery effort has just begun. Native Americans knew this, Berleman says, and used fire to manage landscapes for food and textile production. As David Carle writes in Introduction to Fire in California, indigenous California tribes set fire to the landscape to reduce the threat of wildfires to their villages, to stimulate the sprouting of the stick-straight dogbane stems needed for basketry and tools, to control insects, fungus, and pathogens, and to encourage the growth of seeds. Berleman was in the early stages of launching a fire ecology program at ACR when the Nuns Fire swept through the Bouverie Preserve on October 9, destroying 80 percent of the organization’s structures. A trained wildland firefighter, Berleman spent hours successfully defending architect David Bouverie’s former home along with the Last House, where famed cookbook author M.F.K. Fisher spent her final years. Last May, Berleman conducted a few initial small, prescribed burns to reduce the fuel load on grasslands on the preserve. An early, informal assessment showed that these areas burned less intensely than other parts, and helped moderate the fire’s progression. “Fire can’t be prevented, it can only be postponed,” says Berleman. She advocates for two solutions to future fire threats. First, an “all hands on deck” cooperative approach to fuels treatments on private and public land: prescribed fire, broadcast burning, mechanical thinning, and grazing. Second, improved public education on the integral role of fire in California ecosystems. Recently, the state provided her funding to establish a highly trained, interagency fire crew to implement technically approved prescribed fuels treatments and controlled burns on private land in Sonoma County starting in the fall of 2018. Marie Hoff, a sheep owner and grazer in Mendocino County, says that grazing is the missing link in managing rangelands for fire safety. For centuries, the California landscape was populated by large grazing animals like deer and elk, but those populations have severely declined with widespread human settlement. Hoff shepherds 20 Ouessants, a primitive breed from France with a preference for dry, brushy environments. Hoff’s grazing operation has two distinct functions. Summer through fall, the sheep reduce fuel loads in hilly open rangeland. Come October and rain, they transition into weed abatement on agricultural land: vineyards, orchards, and farms. In the spring, Hoff breeds the sheep and processes their fleece into yarn. With the fire recovery phase in full swing, Hoff is working to bring together stakeholders like University of California Cooperative Extension to position agrarians as a solution to managing for a fire ecology on public lands, open spaces, and regional parks. 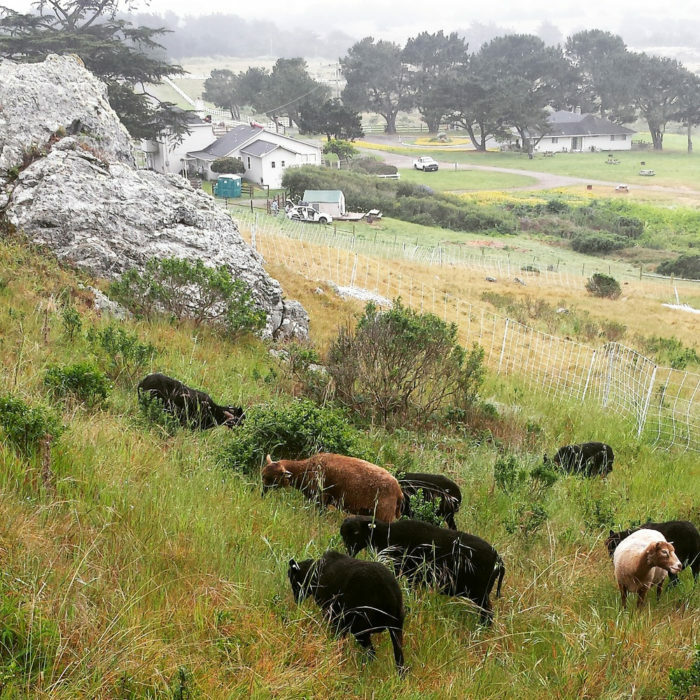 Her small flock, while not big enough to address the scope of the need, will provide a model for projects in Mendocino and Sonoma counties, followed by larger-scale grazing contracts based on mapping for high fire-prone areas. Despite protests, certain land planning rules were overlooked, including a ridge-top ordinance that prohibited development on the hills above Santa Rosa—a debate that’s come back to haunt city planners and engineers. Did these large homes built on tight lots contribute to the fire’s intensity? “Bigger homes, closer together is a recipe for more fuel on the landscape,” says Gregory L. Simon, an associate professor of geography and environmental sciences at the University of Colorado and author of Flame and Fortune in the American West. “In my opinion, we shouldn’t be building homes in areas of high fire risk at all. It’s not a matter of building fire-safe construction or zoning in certain ways. Simply because of the loss of life involved and the risk to first responders. From extensive study of the Oakland/Berkeley Fire of 1991—formerly the most destructive fire, in terms of property damage in California history, but now outranked by the Tubbs Fire—Simon says homes rebuilt in fire risk zones should be constructed according to the most stringent standards, with the municipal infrastructure to handle wildfire events. Water pipes should be broad and able to accommodate the large amounts of water needed to fight a fire. Roads need to be wide enough to accommodate fire trucks. And above-ground, exposed power lines, which carry a host of hazards, from explosion to blocking roadways, should be moved underground. A group of residents in Ventura County, which was hard-hit by the Thomas Fire, filed a lawsuit in December alleging that Southern California Edison Co., the area’s largest electrical supplier, ”failed to maintain overhead electric and communications facilities,” which may have led, in part, to the ensuing firestorm. “If we understand that an area has a fire risk, but, for whatever reason, the city wanted to develop that area, the least they should do is make sure that this municipal infrastructure components are fire-compatible,” says Simon. For her part, fire ecologist Sasha Berleman says this is a crucial time for Californians to acknowledge the role of fire in the state’s ecology, wherever their home is located. Maybe it’s time to learn from the dogbane. Top photo © Leilani Clark.